The U.S. Mint has the production capability to meet Silver Eagle demand, but it’s unable to always buy enough planchets for that to happen. The agency has rationed sales to prevent periods of suspensions. United States Mint distributors this week can order up to 1 million American Eagle silver bullion coins. They can’t buy as many as they want because the U.S. Mint has rationed the 99.9% fine silver coins since temporarily running out of them in July. One million a week has been a common limit, but it does mark a 7% reduction from last week’s supply of 1,075,000 coins. The week before then also had a cap of 1 million coins. The level retreated to as low as 750,000 coins for the week ended Sept. 25. The next weekly allocation will be announced on Oct. 19. Weekly inventories are normally claimed within the first two days. Last week was an exception as the supply held out for 4 days. 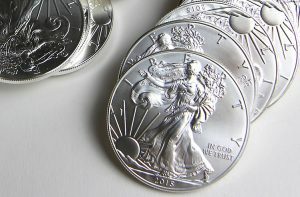 Bullion American Silver Eagles remain on track for an annual record. Sales for the year at 37,129,500 coins are 6.8% higher than through the same time last year. In 2014 when the record hit 44,006,000, the coins through Oct. 12, 2014 posted sales of 34,771,000. The U.S. Mint also limited sales last year but not during the summer months. The United States Mint does not offer bullion coins directly to the public. They are sold through a network of authorized purchasers. AP’s consist of major coin and precious metals dealers, brokerage companies, and other participating financial intermediaries. They must pay $2 more than the spot value of each Silver Eagle they buy. Anyone ever consider collecting a lesser mintage 1 oz silver coin ?